ExtraDigital was first approached to undertake SEO work for an eCommerce tile shop back in 2011. The client was having difficulties in getting a good return on investment for their SEO work and wanted assistance and consultancy with onsite optimisation to increase their revenue and grow their business. The client was having difficulties in getting a good return on their SEO investment and wanted help and advice with improving their SEO on the website and growing their business. The first step was to do detailed keyword analysis and examine current site data and sales conversions to identify areas for improvement. Our experience developer team used their detailed understanding of technical SEO to review the site structure and code, identifying where both SEO and customer experience could be made better. Our content marketers reviewed the site pages and also identified where these could be made more effective for both SEO and sales generation. SEO theming of the website for the broad phrase coverage "tiles"
Category level SEO for broad phrases such as "bathroom tiles,"wall tiles" and "mosaic tiles"
Initial onsite SEO work improved page content and caused a sharp increase in relevant organic traffic. 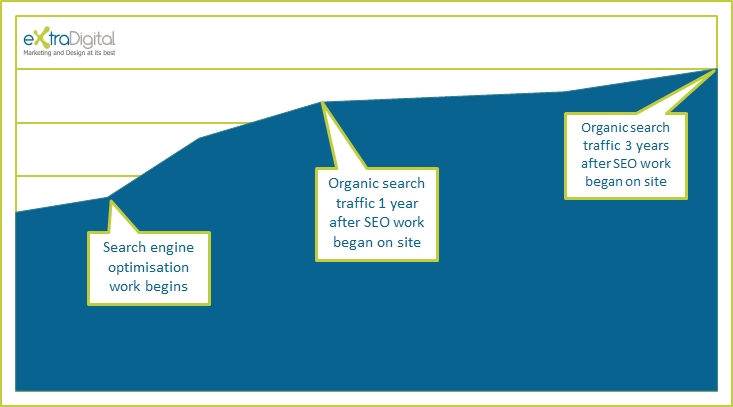 After this work focused moved to offsite SEO to build domain authority. Here we grew domain authority using sustainable and high-value inbound links. The graph below shows organic search traffic growth over time (exact figures are not shown to preserve client data confidentiality). Click to enlarge. 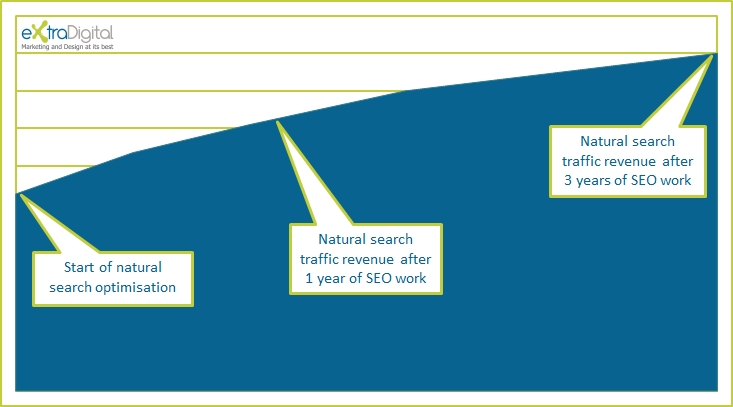 The graph below shows revenue growth for the tiles shop for the duration of natural search marketing work (exact figures are not shown to preserve client data confidentiality). Click to enlarge. 44% year on year traffic increase for broad match keyword "tiles"
If you are looking for sustainable and effective growth for your online tiles web shop, Extra Digital's SEO services, sector familiarity and design and development assets can help you realise significant growth in revenue, traffic, and business brand. Contact us today to find out more, get a free website SEO review and find out how we can help you grow your online tiles business.